You can tell it's been too long since the last food post. 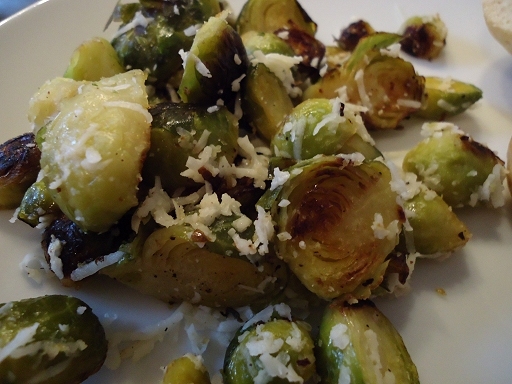 When I cooked these (in the summer) I couldn't find any fresh Brussels sprouts so I had to buy frozen. Now, I must confess that I don't like sprouts. Then again, in previous Nigella recipes, she's done very well at taking vegetables I don't like (namely peas) and making them actually appetising. And, considering the cheese and garlic and stuff added to these sprouts, the recipe seemed promising. The verdict? Nah. Brussels sprouts are still bitter and horrible to me. These tasted like bitter and horrible sprouts, but with nice things added on top. Better than normal sprouts, yes. But not enough to persuade me to make them again. I made a mistake with this one: I accidentally bought the wrong beans! Instead of plain kidney beans, I bought kidney beans in chilli sauce. I tried to rinse the sauce off, but there was still a lingering taste of it that I couldn't remove. 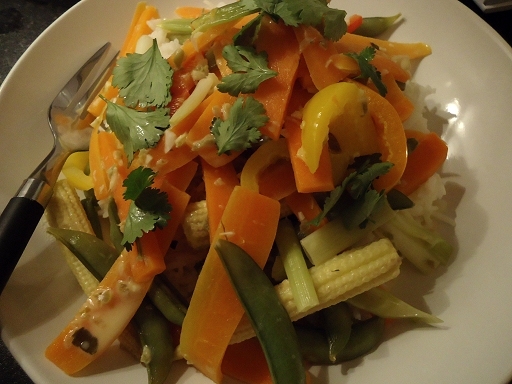 That said, the chilli sauce taste actually went really well with this recipe! 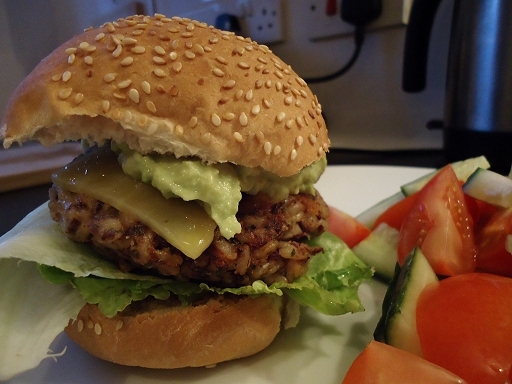 I can't say what these burgers would be like with bog-standard kidney beans, but the burgers I made were wonderfully tasty, and the brown rice adds a nice savoury background. The only issue I had was that the burgers wouldn't stay together once I was eating them, and would fall all over the place. But if you are quite happy to eat a super-messy burger, then these get the thumbs-up from me! This is fairly easy to make (although nothing that requires zesting a lemon is truly easy) and tastes nice. 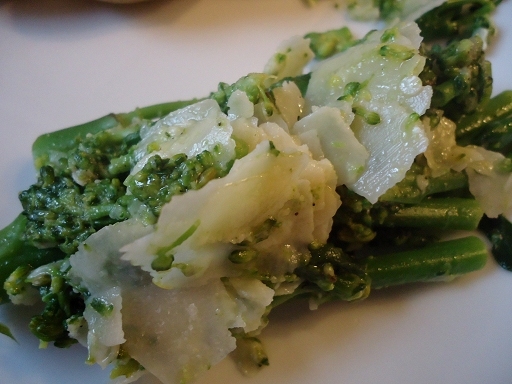 In fact, it tastes just like broccoli, lemon, Parmesan and olive oil. There's not really anything else to say. I wasn't sure what to expect from this recipe. The name doesn't sound appetising to me, and the finished product didn't look that appetising either. 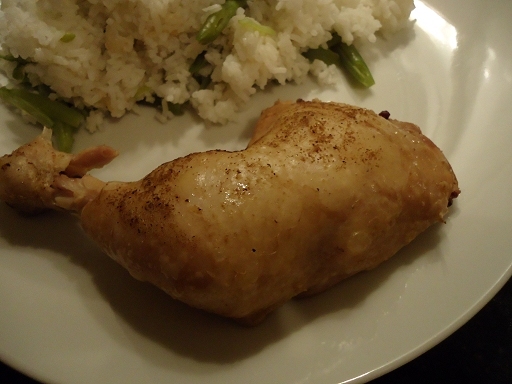 Also, I'd never cooked a whole chicken leg before; I was surprised to find that you could buy them in the shop! The recipe was easy enough to make, though. You boil up the chicken legs with lots of spices, and lots of salt, then let them cool. Job done. (Note, I didn't add any Shaoxing wine to this, and I couldn't find any cao guo, so that got left out too.) Uncertain, I gave the finished chicken leg a taste. Oh man, IT IS SO GOOD, GUYS. The level of salt in the final product is just right and the spices make it really tasty. Overall, the taste was really reminiscent of southern fried chicken, which I love. I'd count it as a roaring success. So, I made the paste and then used it to make a batch of vegetable curry. The recipe suggests you could make chicken curry instead, but I was all chickened out after the previous recipe. The ingredients list says you can make the curry paste with ginger or galangal. I had ginger, so that's what I used. And I couldn't find shrimp paste, so I substituted with fish sauce. As for what the curry tasted like? Well, it was a) far too hot for my tastes, and b) kinda bland all the same. Maybe it was because I used vegetables rather than chicken, but there was a umami-ness and saltiness missing. All I could taste was chillies and coconut milk. Meh. Eating this felt like a chore. Cauliflower salad? I had never eaten that before, which made me uncertain. Also, the ingredients list is full of things I don't like much: sultanas (too sweet for a savoury dish); dry-packed black olives (too salty); toasted pine nuts (too greasy). Also, I didn't add in the Marsala. This did not bode well. But I persevered anyway and do you know what? It was nowhere near as horrible as I thought it was going to be. It was actually pretty tasty! Somehow all the sweet/salty/greasy ingredients cancelled each other out. 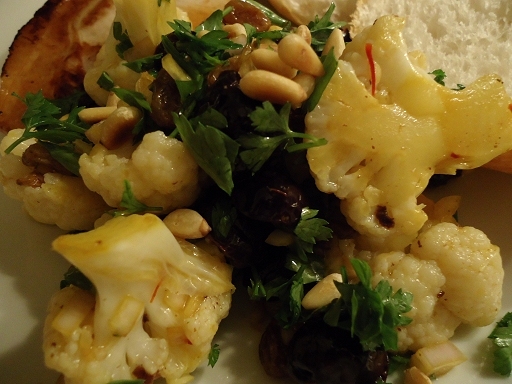 The only odd part is that the cauliflower is only cooked very lightly for this dish. Once you get over the fact that the cauliflower is crunchy as you eat it, then it's pretty decent. Flush with the success of my first chicken leg recipe, I decided to attempt another. Perhaps this time I was too confident. Because, my God, this recipe is difficult to make! I mean, part of it is my fault for not following the recipe entirely. For example, after marinating the chicken legs, you're meant to let them dry in the sun for one hour. Firstly, we do not get that level of sunshine during a British winter. Secondly, no, I am far too scared to let the bacteria in a raw piece of chicken incubate in the warmth of the sun. So instead I rested the chicken on a strainer and let it dry in the fridge for an hour. The other thing I'm too scared to do is deep fry anything, especially as I do not have a special deep fat fryer. (I'm sorry. I can't help it. I just don't want to burn the kitchen down.) So, firstly I tried to shallow fry the chicken legs. Yes I realise how mad that sounds. After AN HOUR of shallow frying, they were still uncooked in the middle. And so, beginning to worry that I was giving the raw chicken a nice incubating anyway, I then put them into the oven for twenty minutes, which got them cooked all the way through. The other issue with the recipe is that the marinade for the chicken calls for a tablespoon of ginger juice and a tablespoon of red shallot juice (tiny note: I couldn't find red shallots, so used normal ones instead). Maybe you can just buy these juices in Singapore, where this book comes from? Or maybe everyone there owns a juicer? I do not own a juicer. I don't even own a blender. HAVE YOU EVER TRIED TO JUICE A SHALLOT BY HAND? I grated a whole bag of shallots, then squeezed the gratings through a tea strainer. OH MY GOD. So many shallots are needed to get a tablespoon of juice, and they are so slippery and hard to grate, especially when the shallot fumes are making you cry your eyes out. After that, the ginger felt like a breeze, but the juicing of that still took about 45 minutes. So, after all that effort (it took me about five hours in total, guys), you would hope that the final product would be rather tasty. And it seemed promising; even though I left out the Shaoxing wine, the chicken smelled amazing as it cooked in the oven. Oh, if only that smell carried over into the taste! Don't get me wrong, this dish tasted fine. 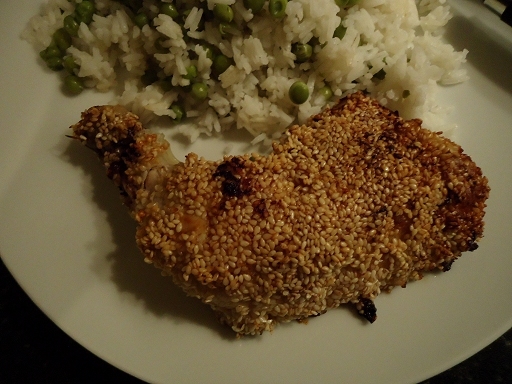 But mostly it just tasted like cooked chicken with (crunchy, and a little greasy) sesame seeds on the outside. I just... for that level of effort, I needed something that would blow my socks off. This did not blow my socks off. Nigella helped calm me down after all that chicken leg business with an easy recipe. (Although, once again, nothing that requires zesting a lemon is truly easy.) This dish tasted ok. 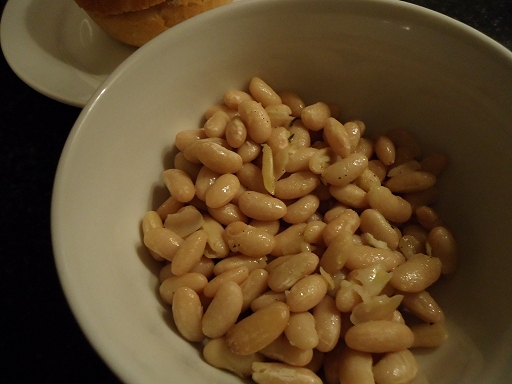 It tasted like beans with olive oil, rosemary and lemon added, which is certainly a pleasant thing. But, you know, I'm not the biggest fan of beans because of their mealy texture, and that texture was strong in this dish. I don't know though. I was just happy to find a recipe that didn't take five hours to cook while taking five years off my life in the process. This was the first recipe I tried out in 2017 and it seems I continued on with the Asian theme. I had received a tonne of Japanese ingredients from my secret santa for Christmas and I was dying to make something with them. First up was the silken tofu. As soon as I saw it was silken tofu I knew I wanted to make ma po tofu (which isn't a Japanese dish at all, but a Sichuan one). I first had ma po tofu at the house of a colleague, who was from Sichuan, and I loved it (she's a great cook). I then ordered it at a couple of restaurants but didn't find it quite so great, as well as being slightly too spicy for me (I realised then, that my colleague had probably reduced the amount of chilli to suit an English palate, because I know Sichuan cuisine is supposed to be super spicy). 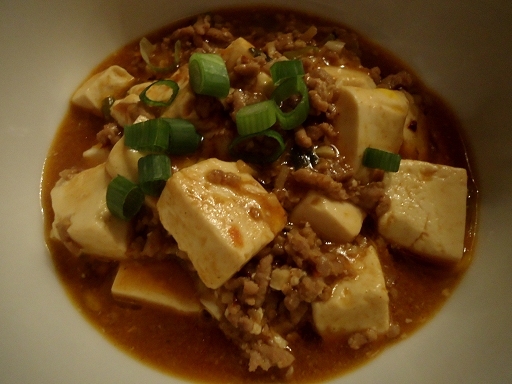 Still, I couldn't shake the desire to eat ma po tofu again, and so a quick google search brought up this recipe. Looking at the ingredients list made me worry that this would indeed be too spicy for me. But I couldn't find Sichuan chilli bean paste or sauce, and so I bought a bottle of something that purported to be Korean chilli sauce instead (it was either that or Mexican-style sauces), and that was maybe my saving grace because the sauce I bought wasn't very hot at all. (Note for the pedantic: I also didn't add in the Shaoxing wine.) And, man, I say "saving grace" because this dish was so good! Wow. It was just as lovely as I remembered it being from my colleague's house. So tasty! Yum yum yum yum yum. If you ever find yourself in possession of some tofu, you have to make this. 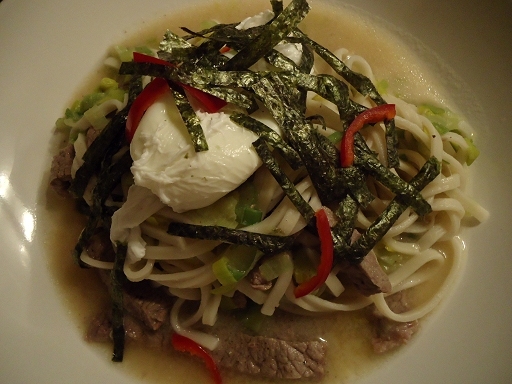 Finally, we have a Japanese-style dish. I choose this one so I could use the nori, udon noodles and miso that I received for Christmas (I used sweet white miso paste, here). This recipe doesn't take too long to cook, but the cooking is full-on. There was a lot of multitasking by cooking several things at once that all needed a lot of attention. Additionally, this is the kind of recipe that seems to use up every single pan and cooking utensil in your kitchen. Washing up afterwards was a chore. The end result? It was nice; not super amazing, but pleasant enough to eat. I wondered why I was having to bother poaching an egg as well as everything else, but the egg actually went really well with it. Overall though, I feel like the dish was missing some kind of saltiness or something. Maybe it's because I used white miso paste, where brown miso paste would have been better? Who knows? Oh my god, I lost all 1963248241893274 of my bookmarks, and you have no idea how many ways a person can misspell “tinnedfruitconundrum.net.” Also I thought it had a “the” in there. I ended up having to resort to Google. I don’t like Brussels sprouts, yucky yucky, but that sesame fried chicken leg is calling my name. Here in the US people seldom cook the leg & the thigh together, but it looks like it might up the flavor/moisture, maybe? Worth a shot. Imma try the ma po tofu recipe also. I wonder if “minced pork” is the same thing as “ground pork"? I’ve also noticed that, as an Old, when I put alcohol in a recipe these days it gives me king-under-the-mountain levels of heartburn. A couple of days ago I made bourbon chicken with actual bourbon in it, and it’s still trying to kill me. Not that much bourbon, even! The people of Esgaroth will pay. Everything else looks really amazing; I know you’re very modest, but it seems like you’re really turning into a skilled chef. I’m very impressed! Also moderately intimidated, wow. Your local friends/coworkers are some lucky people. Oh, also — I do think you should get a DSLR! (If you feel like it, obvi.) Can you imagine the food photos? Oh man, a DSLR would be the dream. The price though! Augh! Yes! You should definitely make ma po tofu. It is so good! Not the most simple recipe in the world, but not that hard either. And the taste more than makes up for it. I don’t know what it’s like with firm tofu, but with silken tofu it has a wonderful mouthfeel. And yes, ground pork = minced pork. Thanks for the lovely compliments! Due to boring real life busyness, for the past few weeks I’ve had to restrict myself to making dinners that take no longer than 10 minutes to prepare. And I am dying to get back into the kitchen :( Soon, hopefully. Soon.